Can the movement achieve lasting change? A movement to protect and expand girls' rights around the world is gaining support from governments, international donors and advocacy groups. Improving girls' lives is not only a moral issue — research shows it also speeds economic development. Activists are pushing to end child marriage, educate all girls, improve their reproductive health and reduce violence and discrimination against them. 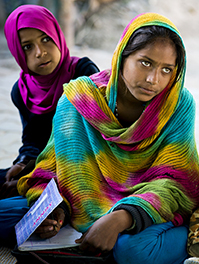 Although girls' mortality and school enrollment rates have been improving, obstacles remain. Nearly 120 million girls do not attend primary school, and 15 million girls under 18 marry each year, often under duress, ending their schooling and putting them at risk for domestic violence and health complications. In some countries girls' progress is threatened by religious extremists, such as the Taliban in Afghanistan and Pakistan, Islamic State in Iraq and Syria and Boko Haram in Nigeria. Activists say that to have lasting effects, girls' rights campaigns must establish effective on-the-ground programs that change societal attitudes as well as local policies.